Wahoo! Today was Day #3 of Chocolate and Salt Theme Week. But, today wasn't just any day -- and the salt wasn't just any ordinary salt. This week was a big chocolate milestone week. 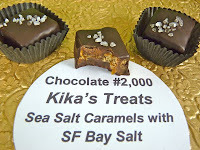 Today's custom-crafted Sea Salt Caramels from Kika's Treats (San Francisco) were topped with (hometown) San Francisco Bay salt. 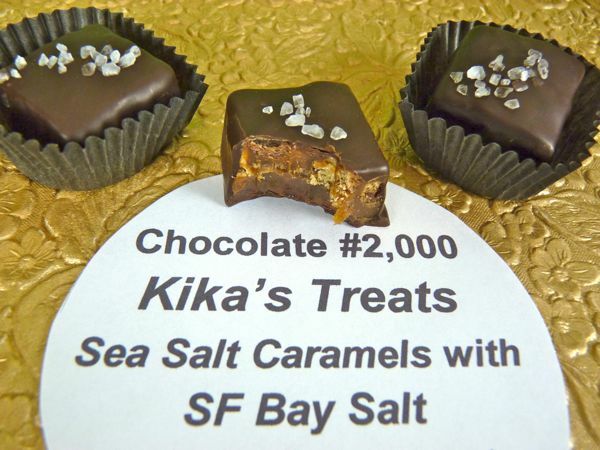 And, drum roll please, Kika's chocolate caramel treat, made with coconut palm sugar and puffed brown rice, went down in the (b)logbooks as the 2,000th unique, daily chocolate to appear here on Chocolate Banquet -- a tasty adventure that began more than 5 1/2 years ago. OK, enough with the numbers. It really is more fun to focus on the great chocolates being created. Thank you to Cristina B. (the wonderful force behind Kika's Treats) for whipping up this special batch for this occasion. These will also be served at my "Walking the Bay" exhibit in San Francisco this week.